Accounting & Finance Career Day brings together students and local employers for networking and professional tips. (NEW ALBANY, Ind. )–This year’s Accounting & Finance Career Day brought 22 local employers and four professional organizations to campus to deliver real world insights and opportunities to students. The event included a panel of industry experts and a bustling job fair. The panel included Tony Schoen, CPA and CFO of First Savings Bank; Leah Driver, CPA and senior manager of Rodefer Moss; Ashley Kratz, lead staffing specialist at LG&E/KU; and Gareth Henley, national bank examiner in the Office of the Comptroller of the Currency. Panelists shared individual experiences, lessons learned and best practices in all areas of employment, from resume and first interview to internships and corporate etiquette. Preparation, whether for the initial interview or a big meeting, was a recurring theme. The job fair brought employers such as Dean Dorton, Rodefer Moss and other local accounting and finance firms. But it also featured companies such as GE Appliances and Tri-Arrows Aluminum, demonstrating the broad market demand for skills in these areas. Jacob Zoeller, a junior from Floyds Knobs, Ind. majoring in accounting and finance, gathered useful insider insights from the panel. T.J. Grace, a junior from Jeffersonville, Ind. majoring in accounting, found the networking component particularly useful. Students gain information and experience in corporate culture through informal networking at the Accounting and Finance Career Day. Amber Arnold, career coach and employer liaison in the IU Southeast Career Development Center (CDC), organized the event in collaboration with the School of Business. According to Arnold, the CDC informed students about the event through email marketing, social media, fliers, bulletin boards and posts on the CDC site. The CDC also offered students the opportunity to have their resume reviewed, gave out guidelines on professional attire and provided padfolios. That networking can pay off earlier than students realize. More than one company mentioned to Arnold that they have entry-level positions such as bookkeeping assistant open to first-year students. “It’s great to know that there are opportunities even for students who are just getting started,” Arnold said. 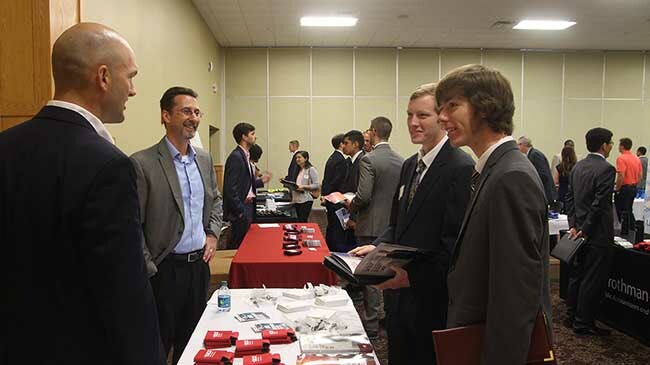 For proof that good preparation can yield concrete dividends, the students needed to look no further than the other side of the panel and job fair tables, where a number of IU Southeast alumni were representing their employers. “It’s nice to see graduates from here working at local firms,” Zoeller said. Homepage photo: IU Southeast accounting majors T.J. Grace (l) and Jacob Zoeller (r) are prepped for success at the Accounting and Finance Career Day job fair.